← Page 29/365 : 6.erm? Today, Dad had to go into hospital. He was suffering some kind of stomach pains and the doctor didn’t know what it was. They think its some kind of Intestine infection but will know better after the X-rays and the scans. He’s staying in overnight. He should be OK. In Leeds United news, apparently it’s a done deal that Becchio will be going to Norwich and in exchange we’ll be getting Morisson and some cash (probably £2.50 BFH). Also, tickets for Man City away revealed at £20 which ain’t a bad price although the tickets are on a loyalty scheme. The match will be on Sunday 17th Feb and on ESbastardPN. Elle cooked a cracking Keema Curry tonight whilst we almost got to the end of Season 3 of Prison Break. Month End at work tomorrow…always good fun……NOT! Everything is always busier and down to the last minute. We’ll see what tomorrow has to offer. Keep getting a stupid little circle on my phone when at work. I basically lose all signal. Grrrrrrrrr. 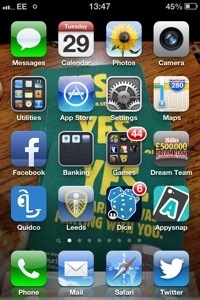 Everything just grinds to a halt…not good with Appysnap in full swing! This entry was posted in Uncategorized and tagged Dad, Hospital. Bookmark the permalink.